As I’m always working on MIS and EDP departments on all of my previous jobs I know the importance of having protection on important and confidential files hence the creation of password. These passwords are used to prevent unauthorized access to your files and to protect sharing of confidential files. It’s vital for companies with restricted use of files and for overall security purposes. It’s very relevant especially that there are employees that may find the need for files that can work on their favors. Well I can say that people are different and not everyone is honest enough not to disclose information. As safe as it may seem password can really work to safely secure the company’s files that are not allowed for public viewing but it has pros and cons. I had an experience of not being able to open files in our Finance department because the one who’s handling it created a password known only by her. In our department all passwords for department’s confidential files are given to the head so in case of emergency that the staff gets sick or not present the head can open it for the President’s usage. The staff resigned without giving the password and we have to do the report all over again. If only we know how to open protected pdf then it would save us time and effort to do it all over again. Now it would not be a problem is such problem arises because there’s a solution for it. With the help of Wondershare PDF password remover we can help users decrypt PDF protections and also remove restrictions on direct printing, copying and editing. It’s a lot of help for users but it should be done by authorized personnel in the company to prevent abuse of usage as it can be a threat also for people who may want to open secured files for their own personal use. It’s really a wonder with them because your entire problem with password protected files can be solved. 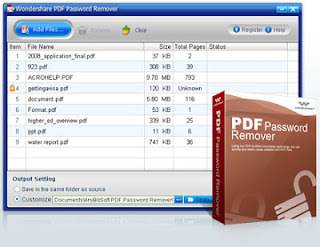 For protected files you can open password pdf by unlocking PDF file first then you can use the PDF password remover to remove the protections on file. You can now open the file even if the one who knows the password have resigned already. There’s no more fear now to lose important data or to make a new report file again if you can’t open the file because of password protection. Again this is recommended for usage by authorized personnel in the company.